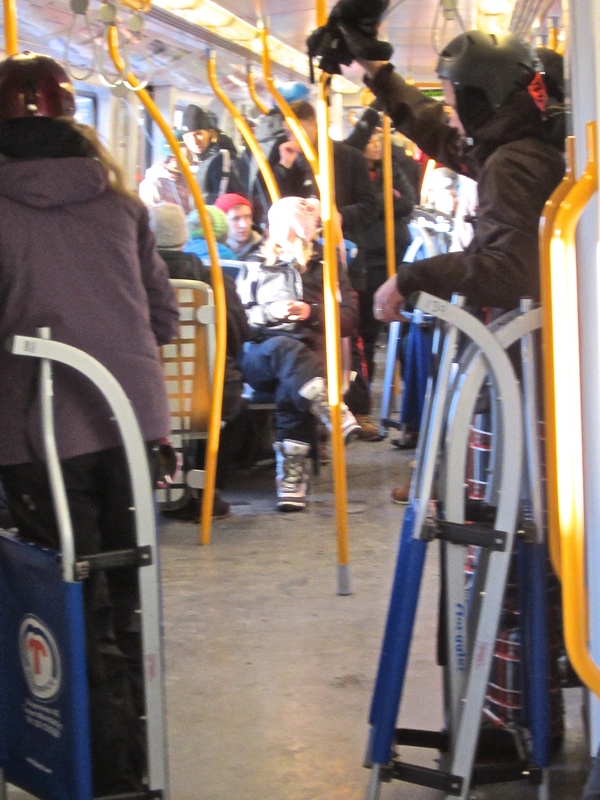 Dozens of sledders caught the train to the top. On Christmas Day, the sun shone brightly for the first time in what seemed like weeks, and all was right with the world. We donned our winterwear and headed out on the T-bane (the Metro train line) to Frognerseteren to admire the winter scenery from the mountain overlooking Olso. A surprising number of Norwegians had the same idea, and when we pulled up to the Midstuen stop, an enormous throng of people toting sleds (called “sledges” here) climbed aboard. Some of these were simple aluminum sleds or state-of-the-art modern confections that looked a bit like tricycles with runners, but others were the more traditional Norwegian version, flaunting their pedigree with their wooden runners and woven seats covered with lambskins. 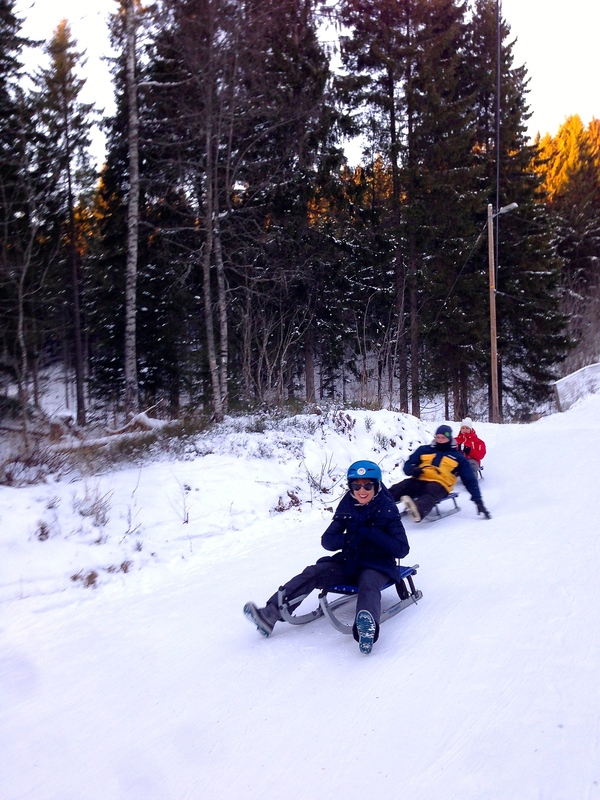 When we arrived at Frognerseteren, most folks got off and made a beeline for the trail ahead, but some stragglers dragged their aluminum sleds over to a small wooden house. Curious, we followed and discovered a sled-rental office, complete with helmets, gloves, and other gear in every size. For $20 per person, we got all the equipment we needed and brief instructions on how to steer the thing: “To turn left, drag your left leg. To turn right, drag your right leg. To stop, drag both.” Sounded easy enough. Crazy sledders, with me in forefront. So off we went blithely, thinking this would be your typical day at the sled hill. Not so much. The “hill” was a mountain and the trail sported steep drop-offs on either side, a glaze of sheer ice in places, and several naked spots where small rocks and boulders added a bit of fiber to the experience. Now the helmets made sense. We pushed off and began careening crazily down the slope, trying desperately to get the hang of steering and stopping before we ran into one of the stone guardrails along the path. All along the way, we spied student drivers who’d ended up stranded in a ditch, hung up in the trees, or victims in a five-car pile-up. The worst were the rubberneckers, who stopped directly in the middle of the path in order to take a photo or gawk at the wreckage on the shoulder. At one point, a Norwegian stopped by the side of the road and gave an earful to two Japanese girls having a Kodak moment, “Don’t stop in the center!!! Are you trying to murder people? !” Somehow, we managed to make it down the hill without becoming roadkill. Looking at our watches, we figured we’d traversed the distance of five train stops in just about ten minutes. Top speed? Maybe around 25 mph (40 km/h). So of course, we hopped back on the train for another go. 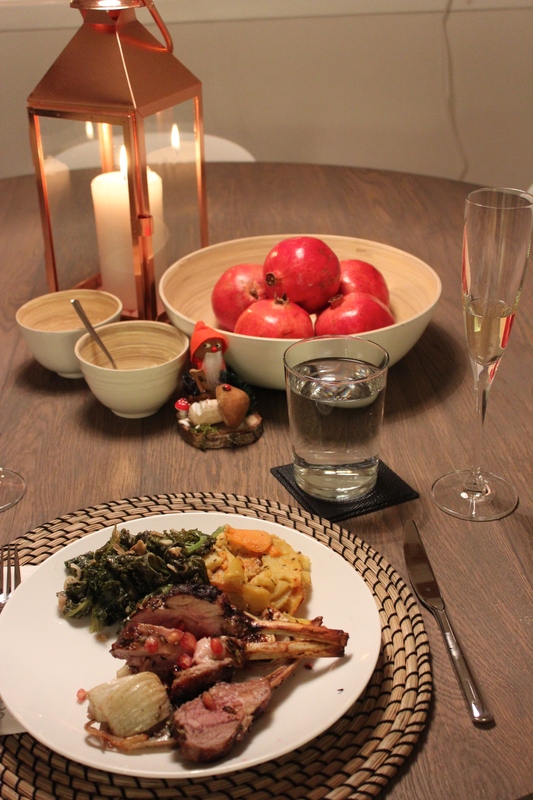 Christmas Dinner: Lamb chops with fennel and pomegranate glaze, creamed greens with chestnuts, and potatoes dauphinois. Note my German Prune Man in the background. After our third time down, we had to wait about ten minutes for the train and ended up dancing a jig in order to avoid frostbite, so we decided it was time to head home. A hot cup of coffee at the rental office revived us a bit, and we made it back just in time for me to get Christmas dinner started. Lamb chops with pomegranate-and-fennel glaze, creamed greens with chestnuts (roasted in our kitchen fireplace), potatoes dauphinois, and lavender crème brûlée for dessert. Nothing like a hearty meal after a day of suicidal sledding. So in the words of a Norwegian, we wish you all a “God Jul,” which is pronounced “Goo Yool” (meaning Merry Christmas), everyone!